The Shiromani Akali Dal (Delhi-UK), the Kendriya Guru Singh Sabha (Delhi) and the Dashmesh Sewa Society have decided to constitute a third front to contest the Delhi Sikh Gurdwara Management Committee election that is to be held before December 31. The India Against Corruption’s newly formed political party looks to have begun its political journey with ease as Arvind Kejriwal launched a frontal attack on the Shiela Dikshit’s government against the rationing of coking gas cylinders, hike in electricity charges and diesel prices, setting the atmosphere right ahead of the next year’s Delhi elections. A 62-year-old schoolteacher was found murdered in her house in Timarpur, this evening, said the police. The deceased has been identified as Madhu Mehra. She lived alone in a government flat. The entire house was ransacked. The police yesterday arrested the wife of the man allegedly involved in a cash van heist and recovered around Rs 47 lakh, the police said today. Two persons were killed while another was injured after their car rammed into a parked truck in Alipur, this morning. Since the introduction of ladies coaches in Metro trains in October 2, 2010, nearly Rs 32 lakh has been collected as fine from 12,757 men found travelling in them. Metro officials claim that most of these men were fined during the initial months of the introduction of the coaches and that the number of complaints has now come down. A 27-year-old woman has allegedly hanged herself from a ceiling fan in her house in Uttam Naga. The deceased has been identified as Reena. This decision was taken after the Supreme Court has directed the Directorate of Gurdwara Elections, Delhi government, that the election to the DSGMC should be held before December 31. SAD (Delhi-UK) president Jasjit Singh said that all the three parties have decided to constitute the third front. "Now we have to decide the number of seats to be given to each party. There are a total of 46 seats in the DSGMC. The front will contest the election on all the seats. We have started meeting people in the city to garner their support," he said. Jasjit Singh said that the people are fed up with the ruling party of Paramjit Singh Sarna in the DSGMC. They want a better group in power that may improve the standard of educational institutes, hospitals and also complete the projects lying for the last many years. The chairman of the Dashmesh Sewa Society, Inder Mohan Singh, who had filed the case in the Supreme Court for the DSGMC election, said that the third front would win the election as the people wanted a change by defeating the Sarna group. The Shiromani Akali Dal (Badal) is divided into groups in Delhi. Its senior leaders in Punjab have no interest in making their base strong in the national Capital, added Inder Mohan. Kejriwal, who hopes to open his party’s account of political innings with Delhi, said that these will be the cause for the debacle of the current government. He urged the people not to pay the hiked power bills. There were many supporters who wanted to serve their own political aspirations by a lift through the party’s ticket. One such was Anil Sharma, a resident of Burari and a freelance writer, who had filled the nomination for the city’s last municipal elections, though withdrew later, but wishes to fight under the new party’s banner. “This is a nice attempt but the performance will be gauged only during the forthcoming polls,” said Sharma. Another supporter, Shyam Gupta, who had earlier contested from Timarpur and lost, feels this party will dislodge the Centre given the anti-incumbent factors. He says that if given a chance, he will surely fight the elections from Kejriwal’s side. “Madhu’s hands and legs were tied with a rope and a cloth was stuffed into her mouth. Robbery could be the motive behind the crime,” said the DCP (north) Sindhu Pillai. The official further said that the woman taught in a government school and lived in B Block of the area. “Her husband died a few years ago. Her only son also met with an accident and died during the treatment. She did not talk to her neighbours and used to go to school in a rickshaw,” said the police official. The police said that it has interrogated her school lab assistant, Rajender Kumar, who used to come to her house daily. “She was in touch with Kumar,” said the official. Geeta (30) of Narela, was arrested from a bank at Durga Puri. Her husband Om Pal worked as the driver of the delivery van of a bank and allegedly fled with Rs 51 lakh on Friday after sedating two employees. "On Friday, Om Pal and four other employees had left the office with a huge amount of cash to refill ATMs. On the way, Om Pal offered his colleagues sweets laced with sedatives. After a few minutes, the three colleagues fell unconscious and Om Pal fled with the cash. The delivery van, without the cash, was later found abandoned in Jehangirpuri," said the police official. 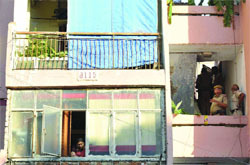 The police raided Om Pal's residence but got to know that the house had been vacated two days ago. It then inquired about him from his employer, but did not get enough information as he was not verified at the time of hiring. "Yesterday, the police got a tip-off that Geeta would go to a bank in Durga Puri and she was arrested there. She is being interrogated," said the police. The deceased are Hitesh and Naveen. Nitin is injured. They were going to Delhi from Sonepat in their Wagon-R car. A soil-laden truck was parked on the roadside. The car is believed to be coming at a high speed and smashed into the truck, the official said. Speaking to The Tribune, a Delhi Metro official said most of the offenders had been nabbed during the peak office and late night hours. "While the number of complaints during the office hours has dropped, there are still problems in the night runs. Our flying squads, which have the authority to penalise any man found travelling in a women's coach, conducts regular surprise checks on all lines. However, there is room for improvement in the safety arrangements for the women travellers during night hours," said the Delhi Metro official. A penalty of Rs 250 is imposed on any man caught travelling in the women's coaches. Initially, the fine was Rs 200, but this was raised to Rs 250 in last November. "The number of women guards on the network has been increased six months back. Metro staff works closely with the Central Industrial Security Force and the state police departments. We get requests for regular checks and drives which are often executed," the official added. In February 2012, 300 men were fined in just one week, leading to a collection of Rs 70,000. In August, 1,538 people have been fined for entering the women coaches. Reena got married to Ajay Bagga, a US-based Indian in 2008. Ajay works with a multinational company.